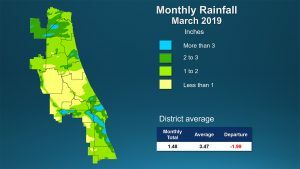 PALATKA, Fla., April 9, 2019 — Data collected by the St. Johns River Water Management District shows that March rainfall was below average districtwide, with a zone of very low rainfall in Lake, Marion and portions of Volusia County. A full report outlining changing hydrological conditions was presented at today’s Governing Board meeting. March’s low rainfall followed a period of prolonged wet conditions in many areas of the district, with surface water and groundwater conditions staying in the high or normal range for this time of year. Abnormally dry conditions in Brevard and Indian River counties remain but are less extensive. Indian River County had the lowest 12-month rainfall total, with 46 inches of rain. Marion, Putnam and Alachua counties had the highest 12-month rainfall totals, each receiving between 61 and 63 inches of rain. Overall, rainfall totals from the previous 12 months remain more than 4 inches above average. For additional hydrologic data or to learn more about the district’s data collection program, visit www.sjrwmd.com/data.